We took the train yesterday to the far western part of Tokyo to have lunch and spend a wonderful rainy day with Ken's friends Norio and Sylvia Mihira. 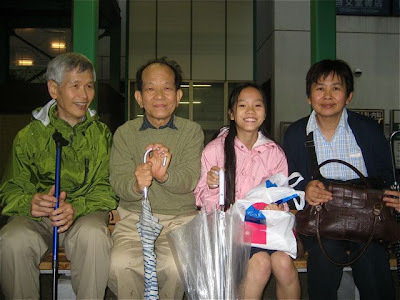 Ken went to Keio University with Norio 40 years ago and they've been good friends all these years. I've mentioned Sylvia before on this blog. She is a great, smart, fun woman from Indonesia who knows more about the flowers and birds of Japan than anyone. She is a painter and folklore researcher as well as having a Ph.D in sociology. They have a beautiful house and a little bird named Poki who rules the roost. And a spectacular garden filled with roses, iris, peony, a persimmon tree, and so many wild flowers. 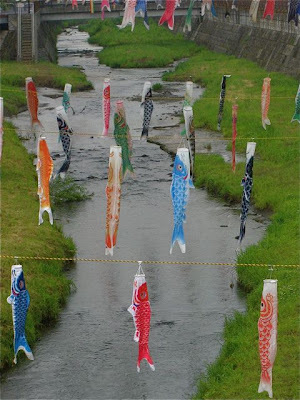 It was boy's day yesterday and very close to their house is a stream and all along the stream, people had hung kites of carp. Here are two photos from our day. The Macro Lens is Back! !